Rooting itself in the Cuban conjunto tradition, this internationally renowned 11-piece ensemble couples a dynamic three-trumpet horn section with a rhythm section featuring Afro-Cuban percussion, piano, bass and Cuban tres guitar. This particular instrumentation gives the group its “classic” salsa sound all the while enabling the sort of stylistic versatility and creative extemporization expected by contemporary Latin and world music concert goers. Conjunto Lacalu’s sound and style pays homage its predecessors such as Conjunto Clasico and Sonora Ponceña with a repertoire that features primarily original compositions as well as a number of original arrangements of salsa and Latin American folk music classics. Conjunto Lacalu was founded in 2008 by Sean Bellaviti, also group’s pianist and frequent arranger/composer. 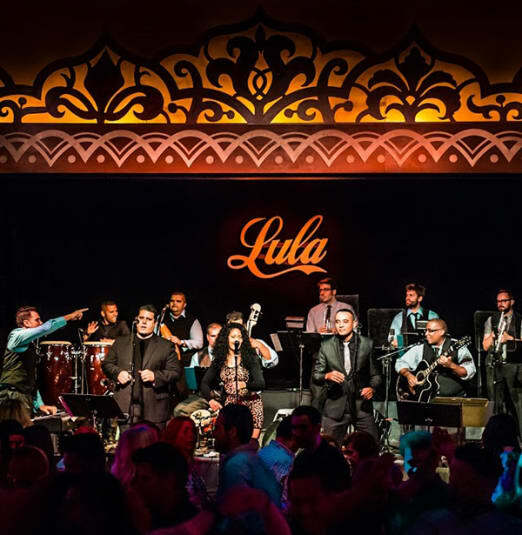 Since its inception the Conjunto Lacalu has toured regularly and been featured at major Latin and world music festivals throughout Ontario, including LulaWorld, Hispanic Fiesta, Salsa on St. Clair, and Pan Am Games Torch Run. As a unit of top tier musicians, this band has been singled out for their outstanding musicianship—a quality that has made them the backing band of choice for visiting international salsa stars including Tito Rojas, Jimmy Bosch, Yan Collazo, Tony Vega and Eddie Santiago.